Our recently published paper documenting shifts in the climatic niches of introduced species has been featured in an Editorial published in Nature today. A link to the article can be found here! Climatic niche shifts are common in introduced plants. I am very excited to announce that our paper has just been accepted for publication by Nature: Ecology & Evolution. In it, we show that almost 1000 invasvie plant species occupy much different climates in their introduced range than in their native range. This finding is significant for several reasons. First, it means that species do not necessarily occupy the same environments everywhere they are found on Earth. Second, it casts doubt on the viability of using information about species’ native-range habitat preferences to predict where they will invade. 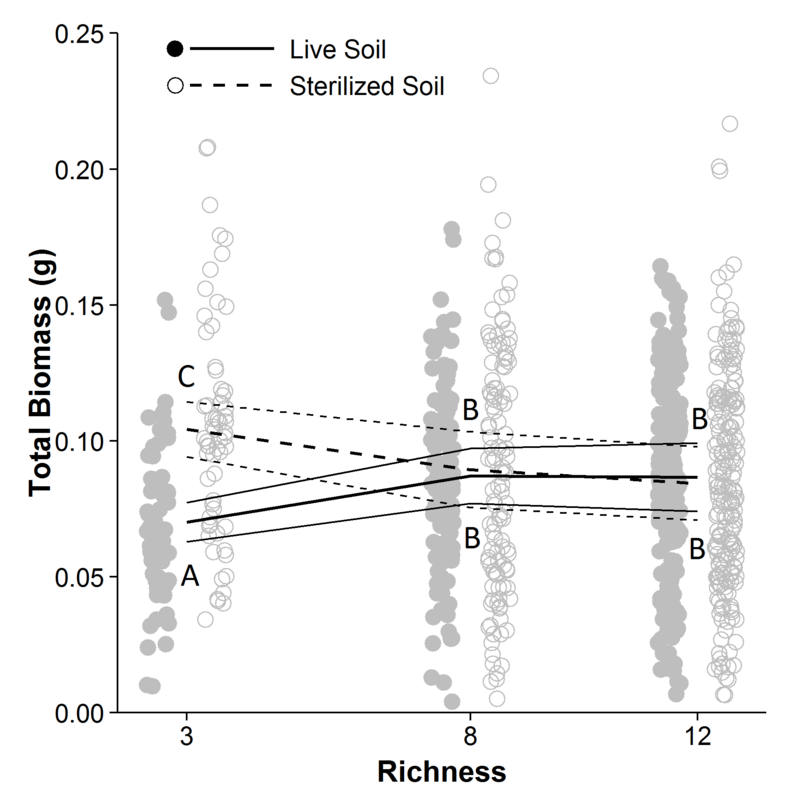 However, we found that niche shifts depended upon species growth form, life expectancy, and degree of cultivation, suggesting that ‘niche shifts’ might be predictable. Particular congratulations go to Carissa Ervine, who contributed to this manuscript as an undergraduate student. She was responsible for assembling the first version of our database of 13 million occurrence records for 1135 species–a major undertaking! In previous studies, we found evidence for striking genetic and phenotypic differentiation in Johnsongrass (Sorghum halepense) populations collected throughout the United States. Here, we report that Johnsongrass may be adapting to local habitat variation. Johnsongrass from non-agricultural populations competed better in a field community than Johnsongrass from agricultural populations. Agricultural and non-agricultural populations were separated by less than a kilometer, suggesting that this species may be adapting to habitat variation at extremely fine spatial scales. These results contribute to a growing list of studies revealing the importance of fine-scale habitat specialization in invasive species, with possible ecological and management implications. I’m happy to announce that PLoS One has accepted Uzay Sezen’s paper documenting the population genetics of colonizing Johnsongrass (Sorghum halepense). Using a panel of almost 500 Johnsongrass accessions from 70 sites throughout the US, Dr. Sezen showed that Johnsongrass was introduced to the US at two locations. It has subsequently colonized much of North America, demonstrating surprising genetic variation even at range margins. Johnsongrass populations have also differentiated strikingly along habitat boundaries, with genetic clusters segregating strongly between crop populations and those found in roadsides and other disturbed environments. I’m very pleased to announce that Annual Reviews of Ecology, Evolution and Systematics has accepted our review article documenting recent advances in our understanding of interspecific plant interactions. I am proud to have been a part of this group. Erik spearheaded this effort and has worked very hard to bring the finished product together. I look forward to the publication of our review in November!